I bet at one point or another you felt you missed the system tray integration feature in some application, be it xterm, an audio player, a file manager or any other program. Well, KDocker is just the thing which comes to help: a simple, yet practical docking application built for KDE4 (older KDE3 version can be found here), but not only. Let me tell you how to use this program in a productive and useful manner. 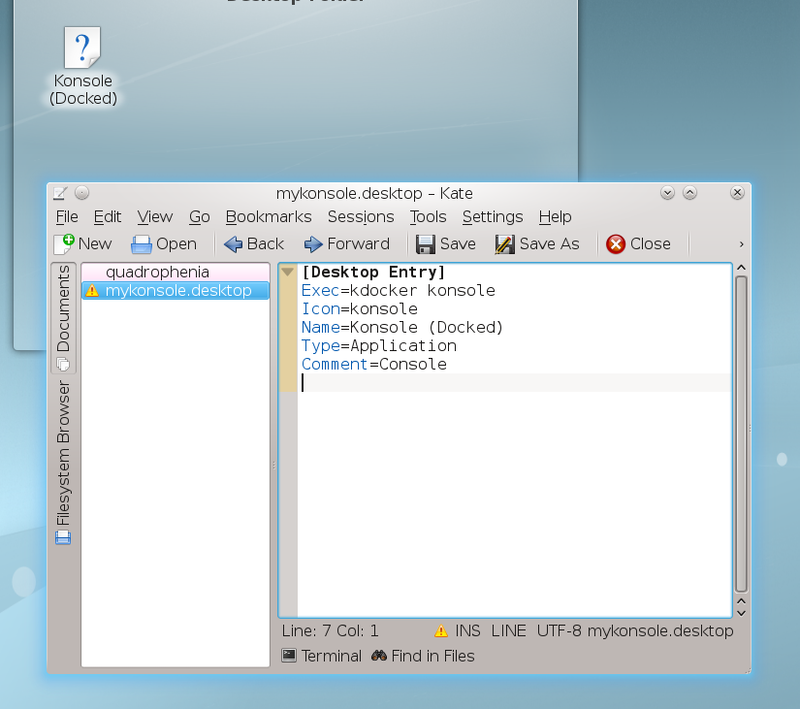 KDocker is a docking application for KDE4 which allows you to dock any application in the system tray. 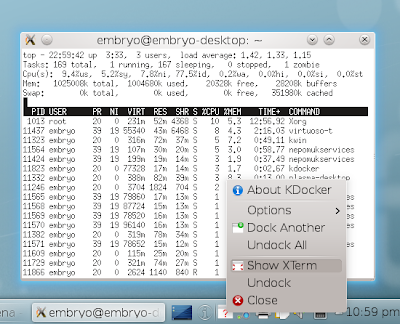 The great thing about KDocker is that it works not only in KDE, but also in GNOME, Xfce and other window managers which are compliant with the NET WM standard. The project is hosted on Launchpad, being actively developed, with the latest version (4.4) released earlier this year, on July 17. To install it in Ubuntu, type in a terminal sudo apt-get install kdocker, then launch it by pressing Alt+F2 and typing kdocker in the run dialogue window that appears. And save the file. 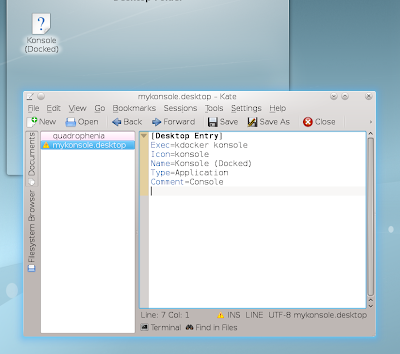 Now, you can click that desktop shortcut to launch Konsole in the system tray. The -e argument tells Konsole to execute the command mc after starting. Have some more uses for KDocker? Please share in the comments below. 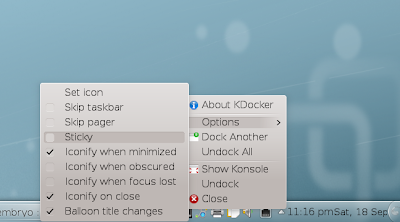 Actually the first step is to install KDocker - it wasn't installed by default with KDE 4.5.1 in the distro I'm using. 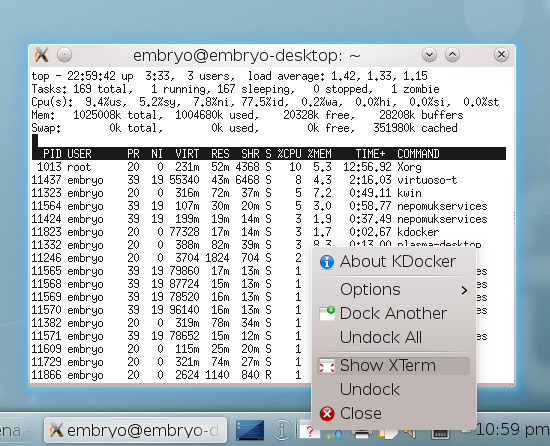 KDocker works nicely. I didn't have to use the .desktop suffix for the file name of the Desktop Config file; I found it works fine with any file name. So, can kdocker set windows to "minimize to tray" when the "close" button is pressed? This is the functionality that I really want (so I can clean up the task bar when certain windows are closed, but have the application still running in the background). Right now, for example, Amarok and Firefox (with extension) can do this. 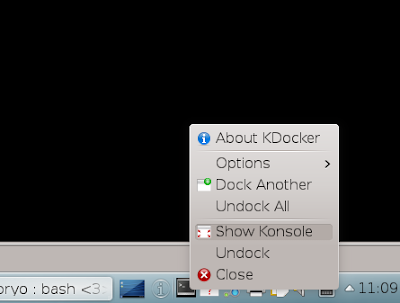 But although I have tried kdocker before, I never could get this working for other programs. Maybe it won't do that?? @Dulwhite: I just installed it, and it does minise apps to the tray. It's even the default setting, as far as I can mke out. If you do not want this, you can uncheck "Iconify when minimized" in the menu.